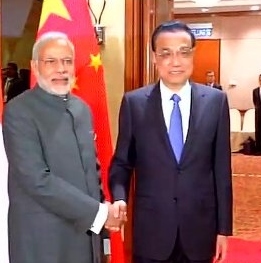 Prime Minister Narendra Modi on Saturday met his Chinese counterpart Li Keqiang who insisted that the world's two largest developing countries have more common interests than divergences, as the two leaders discussed bilateral ties and global issues of mutual concern. "The bilaterals amidst the multilateral. PM @narendramodi meets Premier Li Kequiang of China for first engagement," External Affairs Ministry Spokesman Vikas Swarup tweeted. During the meeting on the sidelines of ASEAN-India Summit, Li said that China and India - the world's two largest developing countries -- have more common interests than divergences. "China and India boosting mutual trust and cooperation will not only achieve win-win results, but also contribute to the peace, development and prosperity of Asia and the world at large," Li said. Citing "Made in China 2025" and "Internet Plus" drives and India's "Make in India" and "Digital India" programmes, Li pointed out that the two countries have compatible development strategies and bilateral cooperation enjoys bright prospects. "China stands ready to join hands with India to beef up cooperation in trade and investment, infrastructure construction and financial services, and broaden people-to-people exchanges, so as to further consolidate public support for bilateral relations," Li was quoted as saying by the state-run Xinhua news agency. He added that China is willing to work with India to strive for "early harvests" in the construction of the Bangladesh-China-India-Myanmar Economic Corridor. Beijing, Li said, also looks forward to strengthening coordination with New Delhi on multilateral affairs and jointly tackling terrorism and other global challenges. Modi arrived in Kuala Lumpur early on Saturday on a three-day visit to Malaysia to attend the ASEAN-India and East Asia summits.